Trying to figure out consumers’ path to purchase has always been a search for the Holy Grail. The adoption of digital media, mobile devices and social platforms has complicated the path further as consumers spread their time and attention over a growing variety of devices and content. Yet there are signs the complexity may be reversing course, that increasing integration across channels and platforms is reducing the number of sources consumers need to turn to when searching for local businesses and services. Perhaps the greatest example comes from an unlikely place: China. In February, WeChat Tencent Holdings CEO Pony Ma Huateng shared that WeChat hit 1 billion consumers, a “remarkable number.” Known as “Weixin” in China, WeChat is the country’s most used messaging app, as well as a platform for social media, rideshare, mobile payments and more. Let’s look at how WeChat works, what the chances are of a similar development here in the US and what kinds of applications such integrated interfaces could mean for local search marketers. WeChat is like combining Google, Facebook, Amazon, Uber, Yelp and Messenger all into one. Developed by Tencent of China in 2011, it started off as a messaging app. WeChat added social media through a newsfeed it called Moments, which is similar to Facebook. As its audience grew, WeChat developed and added features like video, gaming and mobile payments. Creative promotions around the cultural tradition of red money packets led to an unprecedented adoption of user payment accounts linked to banks and credit and debit cards. That growth helped WeChat’s ec0mmerce expansion, starting with an Uber-like taxi-hailing partnership with Didi Chuxing. WeChat’s next step is what launched it into “super-app” status. It opened up its platform to developers to create service accounts within WeChat that synced seamlessly into its existing infrastructure, including its mobile wallet and ordering system. Businesses and brands quickly learned that the limitations imposed by WeChat’s closed ecosystem were outweighed by the benefits of better customer experience and huge audience exposure. 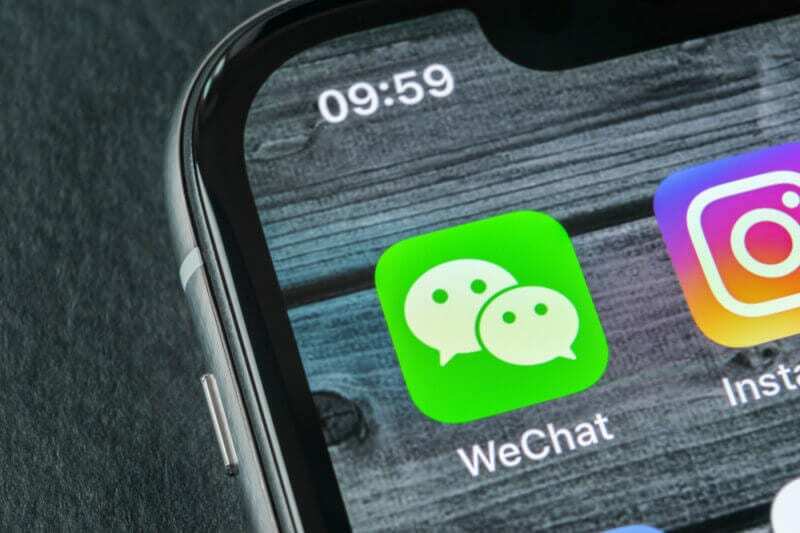 WeChat in return improved the functionality of these integrated accounts on its platform, and in my opinion, became a third operating system in China next to iOS and Android. It also allowed anyone to open up a virtual store akin to Amazon sellers, taking on e-commerce giant Alibaba. Brick-and-mortar retail soon followed, adopting in-store capabilities to take orders and accept payment directly from the app. 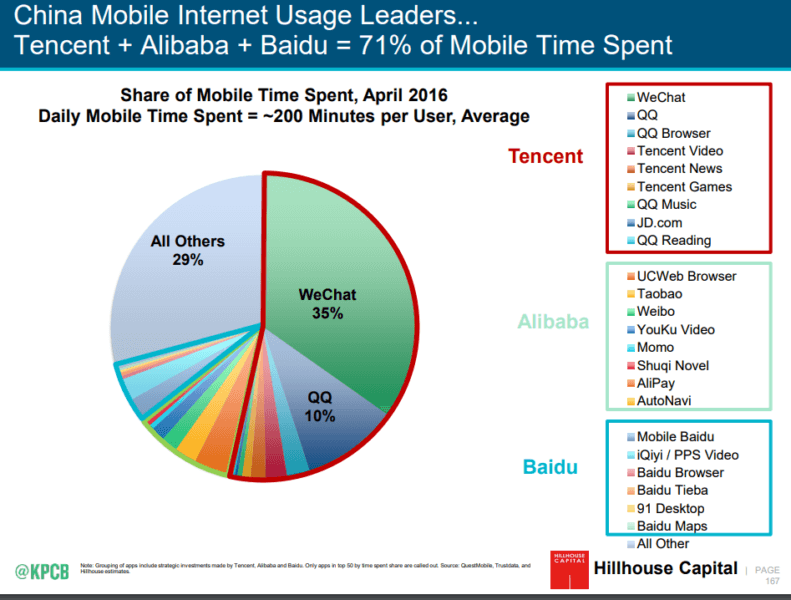 By 2016, WeChat accounted for 35 percent of time spent on phones in China. That was almost double the amount of the next two largest players, Alibaba and Baidu, with the top three taking up a combined 71 percent of user time. WeChat expanded its service account application program interface (API) into true “mini-apps” that were immediately usable within the platform without a separate install, but with greater functionality than the service accounts. Major brands such as McDonald’s developed WeChat exclusive apps, marking a general acceptance of WeChat as a gateway to retail, restaurants, supermarkets and convenience stores. 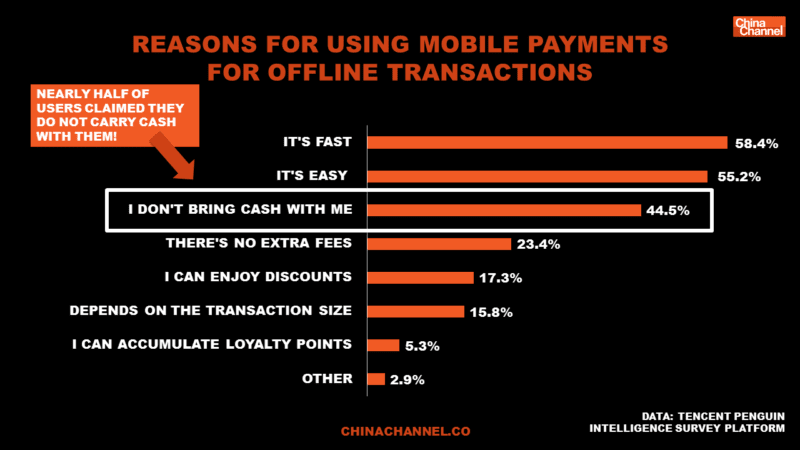 By 2017, 92 percent of WeChat users chose mobile payments as their primary payment method in retail stores, paving the way for a cashless society. Almost half (45 percent) of users admitted to no longer carrying cash with them. 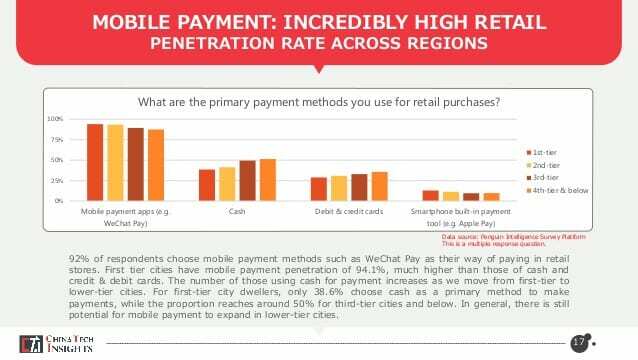 Mobile payment penetration amongst WeChat users under the age of 18 was 97.3 percent last year and is expected to grow. Is there a super-app in our future? Virtually all of the analysis about whether a super-app will ever achieve the same dominance here in the US reflects skepticism. A multitude of reasons are given as to why China is different from the West. Cultural differences, government control and later adoption of internet and mobile technology are all articulately argued against a WeChat type of super-app working here. Yet, even if it doesn’t look identical to WeChat, our future will have more resemblance to China’s society than we may like to admit. Consumer behavior will demand it, and there already exist pieces that, while not of super-app status yet, are the building blocks toward greater integration of the existing and standalone app marketplace. Today, individual apps in the US are built like fortresses, defending against attacks from competitors and preserving the home turf, brand loyalty and brand identity. But the result can be a disjointed and uneven online experience. For example, I was recently looking for a vacation home to accommodate a family group of 11 for a trip. It was a pain having to flip between just two sites — Airbnb and VRBO — to look at different properties, compare favorites and manage bookings. I had to exit each site to log into the other, navigate two different interfaces, enter search criteria again, scroll through results, take notes and then seek directions on yet a third app, Google Maps. All of the back and forth just to get information, and I was only on two apps! There’s no question consumers desire more simplicity and find great value in ease of use. It’s the reason the 99¢ Apple music downloads beat out free Napster songs: Users preferred easy over free and were willing to pay for it. 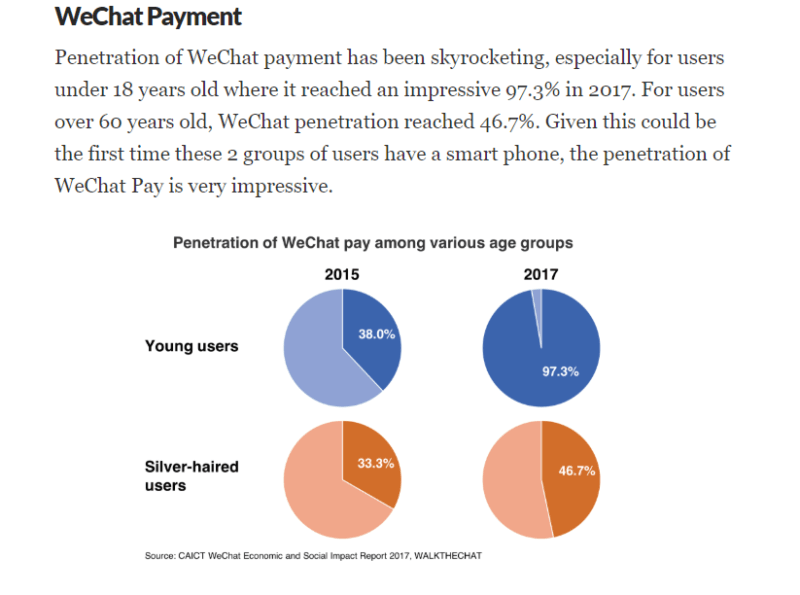 WeChat has flourished for simple, commercial reasons: it solves problems for its users, and it delights them with new and unexpected offerings. That will change the mobile internet for everyone — those outside China included, as Western firms do their all to emulate its success. We’ve seen “easy” play out in the greatest successes of modern technology that have been born out of companies who provide the best customer experience. Google search, Apple iPhones, Facebook’s social media and Amazon’s online shopping are just a few. There’s incentive on the business side to make it easier for customers, too. Amazon’s one-click buy button helped reduce a 70 percent cart abandonment rate and boost lost revenues by billions of dollars. A social e-commerce app on WeChat, Mogujie, doubled its conversion rate by developing a mini-app on WeChat when compared to the performance of its standalone native app. If consumers want more integration, and if businesses benefit from it, then it’s a safe bet that we will see it happen. Maybe the US model will be more of a “Justice League” version of super-apps where four or five dominant apps cover the gamut of shopping, services, transactions, entertainment and social media. There will be a consolidation of numerous functions, features and technology services into far fewer gateways or platforms. How will super-app-like integration affect local search? Local search today is premised on an age-old concept of a business lead. If you get enough leads, some number of them will convert. And there are some things that you can do to improve the quality of those leads. Super-apps have the potential to redefine how businesses acquire customers. With super-apps, social influences should increase, as well as social media recommendations. WeChat leverages social interactions to make it even easier to share when you go places, what you like and don’t like, where you’ve shopped and how to meet up with friends. This video from Ray-Ban helps show how all these pieces can come together and make for a new and fresh shopping experience. The app uses the connection on Facebook Messenger to communicate with a friend, view products together, chat with a virtual salesperson and text about what you both see. It also uses the camera to “try it on,” share recommendations via video and purchase the product immediately. There are many other examples of how search products already create the building blocks that may one day grow into super-app features. Right now, these are often still clunky in execution but set the stage for more seamless integration in the future. Google or Facebook login for identification. Many third-party account-based sites incorporate login credentials from Google or Facebook for access to the user’s profile. For example, you can log into the real estate site Zillow using either Google or Facebook credentials instead of creating a new account. Online booking. Local search directories often include booking buttons such as online reservations at restaurants or a request for estimates from service providers. Right now, however, this often requires leaving the directory page and logging in to a third-party site such as Open Table. Worse, the user may be directed to the business website only to be directed again to the booking site. This is a prime example of how greater integration can promote much better efficiency. Maps and directions. Interactive maps like Google Maps are embedded in sites or apps. However, these are often limited in function to zooming in or out and don’t allow other searches, such as looking for what else is nearby. Partnerships with related services. Google Maps now displays Uber and Lyft prices to your destination, wait times and nearby vehicles. However, booking a vehicle requires you to leave the Map app and open the rideshare app. Mobile wallets. Uber implemented mobile wallets successfully and grew its rideshare business on the convenience of cashless rides. Papa John’s uses photo recognition technology to reduce friction by adding forms of payment to customer accounts: Users simply take a picture of their credit card to capture the payment information. Comparison websites like Orbitz or Google flights. These sites help users compare prices across multiple brands without having to visit each separately. However, they either lack the full functionality of the brand site or link you to it once a selection is made. Recommendations from friends. Sites like Nextdoor and Facebook are using social circles to provide recommendations from friends and match them with online profiles or listings of those businesses. All of the above are small pieces of what already happens in WeChat and are a long ways from reaching super-app status. But they are a beginning and form building blocks for future developments. One of the major challenges local search providers have is proving attribution and showing that marketing work performed boosted actual sales. That problem will be solved when everything from search and discovery through transaction and payment all occurs within the same app, even for offline purchases. Data for predicting consumer behavior and serving relevant content at the right time becomes more accurate and effective. Data that can be captured and used includes everything from social signals and entertainment preferences to spending habits and daily schedules. It’s likely that users would willingly share their data within the single app for the benefits they get in return, including greater convenience and personalized content and offers. That voluntary consent trumps the increasing restrictions and privacy regulations being placed on data collection. And of course, there’s the audience. WeChat grew to 100 million registered users by 2012, 14 months from launch. Six years later, that number is now over 1 billion. Publishers in the US have given up control for far less promise as they publish free articles on third-party news aggregator sites and social media newsfeeds for the traffic. Local businesses are also storing their business information in third-party enhanced directory listings such as Google My Business and Yelp. WeChat isn’t just where consumers go to look up information or conduct a transaction; WeChat is an experience. It is where consumers hang out, play games, interact with celebrities, shop, share and live their lives. Even if WeChat interacted with consumers in a small way, it would be a significant shift in local commerce here in the US. The big tech players are positioned in varying ways to make big steps in the integration of features, functions and partnerships that will enhance the customer experience. The post Why the local search marketplace would benefit from a super-app appeared first on Marketing Land.